Administration of DISC – a personality assessment tool to help the teachers identify their unique behavior patterns around four well-researched characteristics: Dominance, Influence, Steadiness, and Consciousness. None of the teachers had had prior exposure to personality-assessment tools. A presentation of science projects, for which winning teams received awards and prizes, was evaluated by a panel of judges handpicked for their expertise in business and education. The winning teams were distinguished by their ability to involve students in developing and delivering the results, the use of locally available materials to create the products, and the utility of the invention in the local market. The next cohort of teachers in Zambia will begin their training in early September 2019. Meanwhile, we will maintain an ongoing relationship with the recent graduates through alumni reunions, continued learning opportunities, and engagement in the future as mentors and instructors of others. As part of a three-year partnership with Funzeleo, Orica invested in the expansion of the Funzeleo mission in Zambia. Orica is a global provider of commercial explosives and innovative blasting systems to the mining industry. A southern central African country, Zambia has a population of 17 million, 67 percent of whom are under the age of 25. 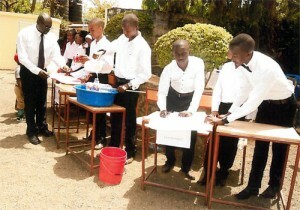 Recently, the Government of Zambia revamped its curriculum to put greater emphasis on experiential learning and vocational training built around math, science, computer skills, and entrepreneurship. With Orica’s support, our programs will enable Zambian youth to pursue high-demand science, engineering and other technical professions. In addition to our Zambian program, we will continue our work in Tanzania, where more than 23,800 students have benefited from our STEM programs in the past three years. In May, Lamech visited the Funzeleo program in Tanzania. He participated in a science fair hosted by the students receiving Funzeleo’s Energy Program at Heradali Primary School. He hosted meetings with business and education leaders who wanted to see continued impact of the program. Funzeleo has a goal of 10,000 students by the end of 2017. With corporate support that number could be even higher and the impact on youth employment and national economic growth would be immense. 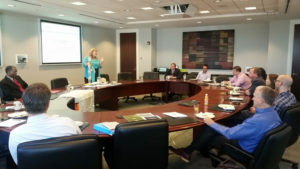 Fifteen private-sector leaders joined Funzeleo board members for an informational breakfast on May 24, 2016. Lamech Mbise, President, updated the guests about Funzeleo’s impact in Tanzania. The attendees got a taste of the health-career program that will be launched in Tanzania later this year; thanks to Dr. Jennifer Hellier, a board member and the program trainer. This event was sponsored by Scot Anderson, Funzeleo board chair. Halliburton has donated hand-held tablets to Funzeleo. These tablets will be distributed to the schools implementing science and engineering programs in Tanzania. “Hands-on experiences are a critical part of Funzeleo’s mission, and these tablets will bolster how teachers teach and students learn science,” says Lamech Mbise, President of Funzeleo. 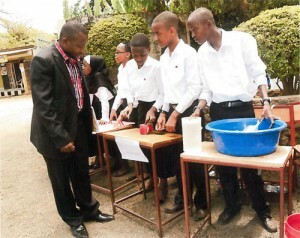 Funzeleo Tanzania had its first science fair in December 2015. Before exposure to Funzeleo’s experience, students presented drawings as part of their science fair. For the first time, students applied their experience in Funzeleo’s Energy Program to showcase their projects on solar, hydro-electric, and wind power. Thanks to mentorship from Funzeleo-trained teachers, the students pulled of a unique exhibit that attracted teachers and students from neighboring schools, as well as over 300 parents and government representatives. The Arusha Region Education Officer, who was the guest of honor, commended the students and underscored the importance of teaching math and science in a way that empowers and engages the students as the Energy Program seeks to do. Funzeleo was one of select beneficiaries of the 2015 Halliburton Charity Golf Tournament which raised a record amount of money for nonprofits across the US. These funds will be used to advance Funzeleo’s mission to inspire and prepare African youth for high-demand science and math-based careers. The Nathan Yip Foundation, inspired by the life of Nathan Yip, seeks to provide educational access, empowerment and ongoing support to vulnerable youth throughout the world, giving them the tools to become productive, contributing citizens within their communities.